The above analysis compares Federal budgets fiscal 2010 to 2007. I’ve chosen these two years to compare because the contrast is both timely (see Joint Select Committee on Deficit Reduction, i.e, Deficit “Supercommittee”) and politically revelatory. 2007 was the last full year prior to the 2008 financial crash and as such it’s a relevant and appropriate baseline. 2010, on the other hand, captures the results of recession fighting deficit spending of almost $2.8 T for trillion split almost evenly between fiscal 2009 and 2010. If 2007 is the norm then 2010 is ‘the not-normal.’ It’s instructive, therefore, to consider them side by side. 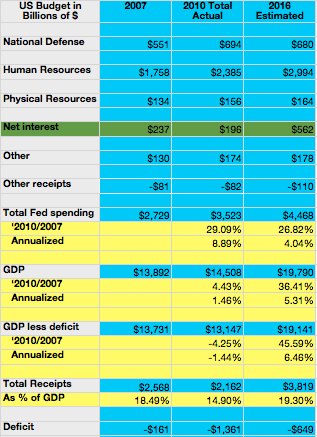 The left most blue column is fiscal 2007 data. The two yellow columns represent the impact of 3% compounding for three years (equivalent of actual estimates for 2010 from prior budgets), the first of which calculates the actual change per line item, the second adds that change to the 2007 totals. 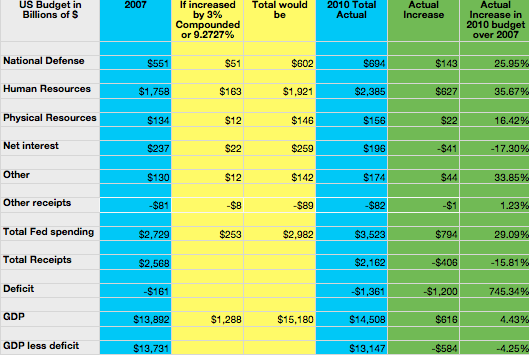 The next blue column is the fiscal 2010 data (1). The two green columns to its right represent the differences between 2010 and 2007, the first is the actual differences and the second is the percentage increase between 2010 and 2007. If you’ll focus on the row Total Fed Spending you’ll note total spending has increased 29% over the three-year period or 20% more than the expected from the baseline. Almost 2/3rds of that increase came through the line item Human Resources. Also noteworthy, is that the Deficit increased by over 745% and GDP only increased at about 1/2 of the expected rate. GDP less deficit spending shows a decrease of 4.25%. What’s most relevant, however, it to expand this analysis by adding the estimate for fiscal 2016 (from the 2012 budget) to the 2007 and 2010 numbers. Also noteworthy is the expected 5.31% annual increase in GDP between 2010 and 2016. Given that current GDP growth through the 3rd Q of 2011 is under 2% the 5.31% appears overly optimistic. If that’s the case Total Receipts, taxes, appear too aggressive unless it includes significant tax increases and so deficits are likely to be much larger than expected. Larger deficits more interest. Check out the Net Interest caption in green to see how interest costs are going through the roof. All of the above this doesn’t augur well for our economy or the US taxpayer. This post is the second in a series on government and financial literacy. Click here for 1st in series. I have adjusted the 2010 budget caption Physical Resources which included a periodic housing credit which is generated every 4 or 5 years as a balancing item from prior year budgets. In order to improve comparability I had the temerity to smooth this item over the last 10 years and so replaced the credit with that smoothed number. This increased the 2010 expenditures by $67 Billion. Gallery | This entry was posted in Fin Lit and Civics, Financial Literacy Basics and tagged American Exceptionalism, Financial Literacy, Financial Planning, Money Management, Personal Finance, Personal Financial Planning, Retirement Planning. Bookmark the permalink. Mr. Jay BRAVO! New base line…a little scary!